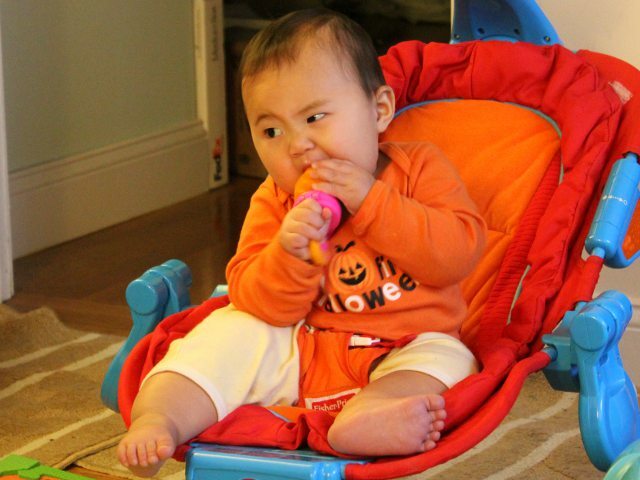 We’ve been experimenting with how to feed baby. When she was younger Arya didn’t mind having us feed her. But now that she likes to touch and feel her food, she makes a huge mess every time she eats. But we discovered that baby eating a tub makes things more fun for her and easier to clean for us. We like dressing Arya in her cute baby Christmas outfit. She actually has a few different Christmas outfits courtesy of friends and relatives. 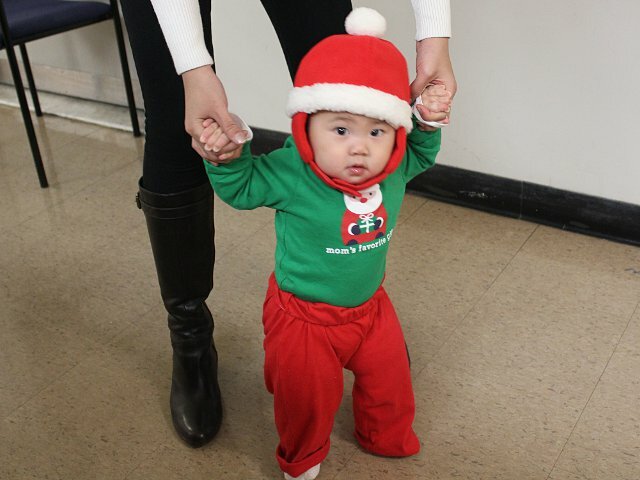 But we like the alternating outfit of red and green when she is wearing her Santa hat. Over the weekend Arya took a cute baby picture at the Massachusetts State House. Since she was already dressed up for a baby picture with Santa, we decided to take more holiday pictures around Boston. Taking a photo in front of the Massachusetts State House was an afterthought as we walked through the Boston Public Garden. 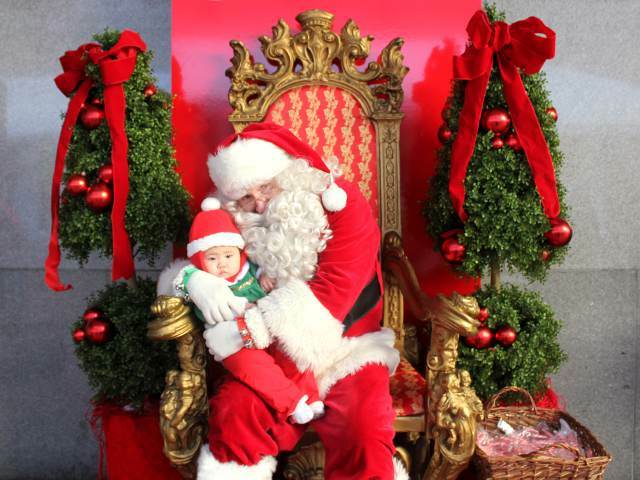 Arya took another baby picture with Santa this week. Since baby’s first picture with Santa wasn’t too scary for her, we decided to take advantage of a cute Christmas display with Santa Claus at the Downtown Crossing Holiday Market. Although Downtown Crossing itself was quite crowded, the holiday area and tented market were only sparsely populated with a few dozen visitors. Months ago we were very concerned with teaching baby to hold her own bottle. Once Arya was able to hold her own bottle we stopped thinking about the process. Recently she learned a new skill on her own. Now every time she drinks milk we see baby holding a bottle with one hand. 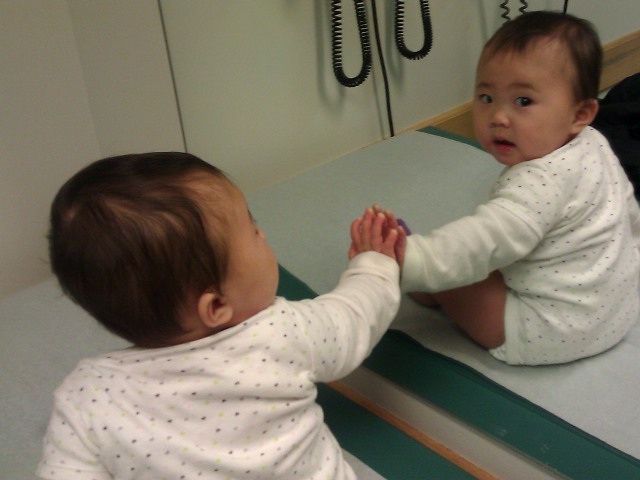 Arya had her nine month visit to the pediatrician this week. The nine-month old baby visit is part of the standard well baby check-up schedule. Mommy and I were excited for Arya’s visit because we both felt she had slimmed down from crawling over the past few months. 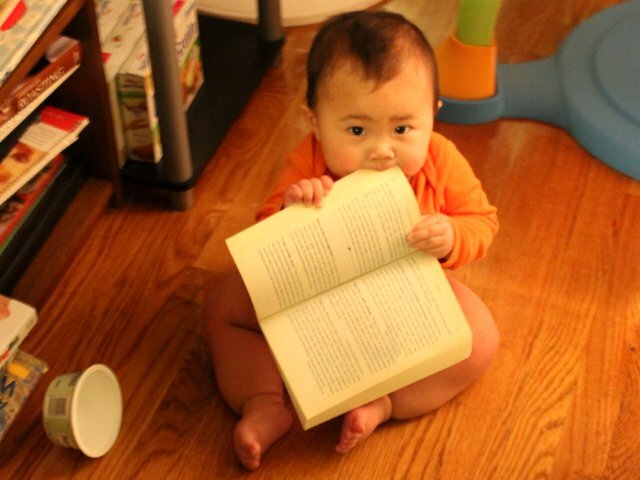 Yesterday we caught baby chewing on paperback books. We keep a bookshelf with Arya’s baby books on the bottom shelves close to the living room and other books on higher shelves farther away. 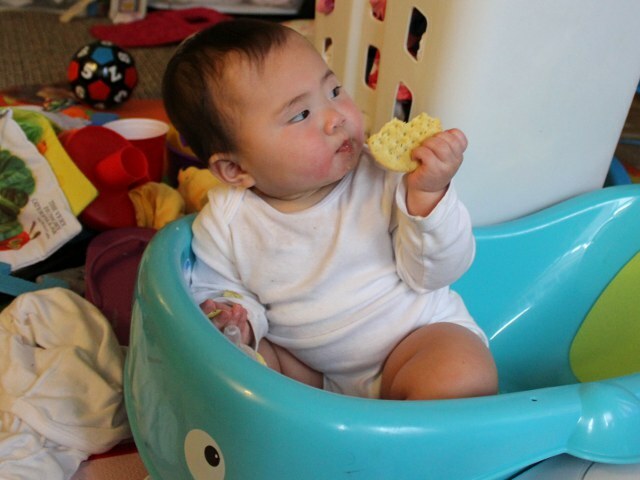 Since she normally stays in the living room on her Alphabet mat the system usually works well enough so that she only grabs her baby board books. 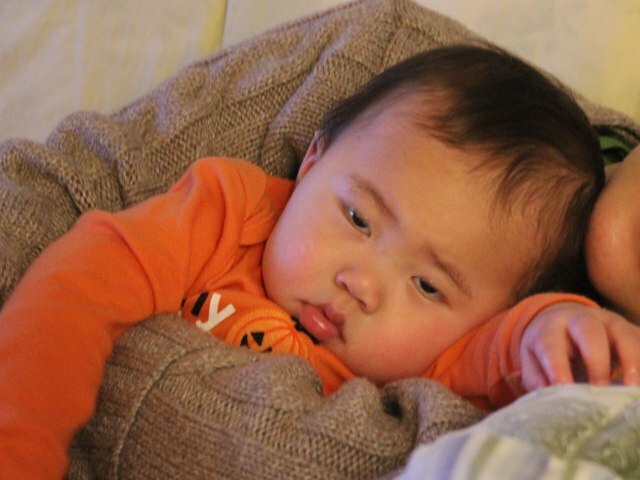 How Much Sleep Does My Baby Need at Nine Months? Even though we rededicated ourselves to sleep training Arya more than a month ago, she still has erratic sleep patterns nearly every day. We’ve been trying to have Arya take three naps during the day. Since this means she struggles falling asleep four times each day, it raises the question: how much sleep does my baby need? Although we are happy that Arya is growing up, she is also becoming harder to watch. 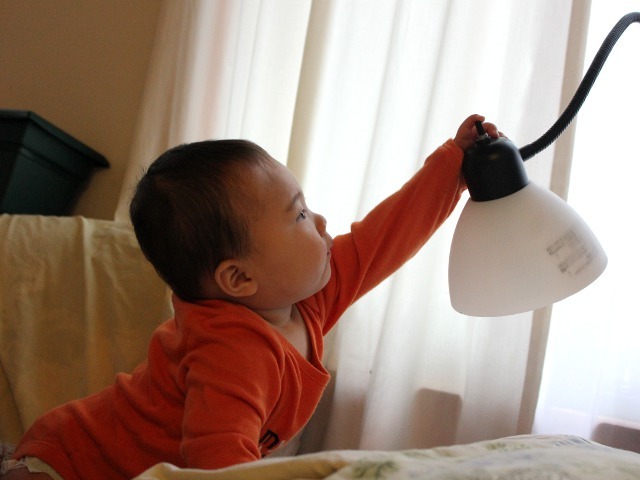 This week baby tried to turn on the lamp and almost knocked down the lamp and all the plants on the windowsill. Both mommy and daddy were close by when she hopped up on the armrest to play with the lamp. Arya has found a new way to entertain herself. She will sit quietly for up to half-an-hour as long as we put a piece of fresh fruit into her Munchkin fresh food feeder. Since uninterrupted, peaceful time is at a premium whenever Arya is around, the Munchkin has become my new favorite product.